If one were to conduct a search for a missing person on a 2d world, all that would be required is to walk across it, because all of the surface of the island would be covered in one crossing. An island completely separates the bodies of water on either side of it. In 3d, the surface of an island is planar, so one must cross the island multiple times at different points to cover the whole island. If one person follows the shore of a 3d island in a clockwise direction and another in a counterclockwise direction, they will meet each other at some point because they are following a one dimensional barrier between land and sea. In 4d, the surface of an island is "realmar" (it is three dimensional). The shore is 2 dimensional, so if two people encircle an island in opposite directions, they won't necessarily meet up with each other. It's just as likely two people crossing a 3d island from random points will meet up with each other. Two large continents can be connected by a thin strip of land without actually blocking off water passage because boats can just circumvent it. If there was a permanent river on a 2d world, nothing below the source of the river would be inhabitable. A river covers every inch of the mountain below where it starts. 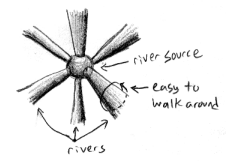 Only one river is possible on a particular slope (because two rivers would essentially be one river with a second source partway down the slope). A bridge to cross a river in 2d is like making a bridge to cross a flood in 3d. In 3d, infinitely many rivers are possible on a mountain, so long as it is large enough to hold them all. A river in 3d separates the land on either side of it, so that a bridge is necessary to cross it. Rivers naturally snake back and forth. In 4d, one can merely walk around a river. No bridges are needed. Making a bridge across a river in 4d is as pointless as us making a bridge over a pond instead of just going around it. 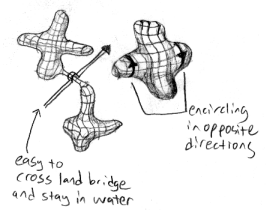 A river in 4d would corkscrew. In 4d, there are three types of lakes: linear, flat, and globular. For a linear lake, no bridge is necessary. 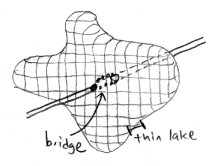 For a flat lake, a bridge is easy to construct. For a globular lake, a bridge would be a difficult task to create. The higher in the dimensions you go, the more porous things become because of the additional directions for things to slip through. In 2d, air can be trapped quite easily. Only two points of contact are require to seal it in. When water runs over the ground in 2d, water can only sink in so far because a seal is formed so easily at all points along the slope. In 3d, a liquid or gas must be sealed in by a linear contact. When water runs over ground in 3d, some of it seeps into the ground because of the air gaps between the particles. In 4d, a liquid or gas must be sealed in with a planar contact. Gasses and liquids can escape containers much easier in 4d. The ground can be much more porous in 4d and still have the same strength as 3d ground. Organic matter could be composed of a higher percentage of water than in 3d. Go to the Site Map for more topics.